A dramatically improved labour market and strong economic performance are having a knock on effect on the consumer economy. This is reflected in the KBC/ESRI consumer sentiment index which shows confidence levels to have increased by 10.6% in the year to February 2016 to reach a 15-year high. This has been reflected in retail spending, boosted by increased disposable income through employment growth and reductions in tax burdens. Irish retail sales remain strong in 2016 with the latest CSO figures showing annual growth to have surged by 11% in February, while the value of retail sales increased by 8.7% year-on-year. If motor trades are excluded, the volume of retail sales are up 7.1% year-on-year while values grew by 4.7%. 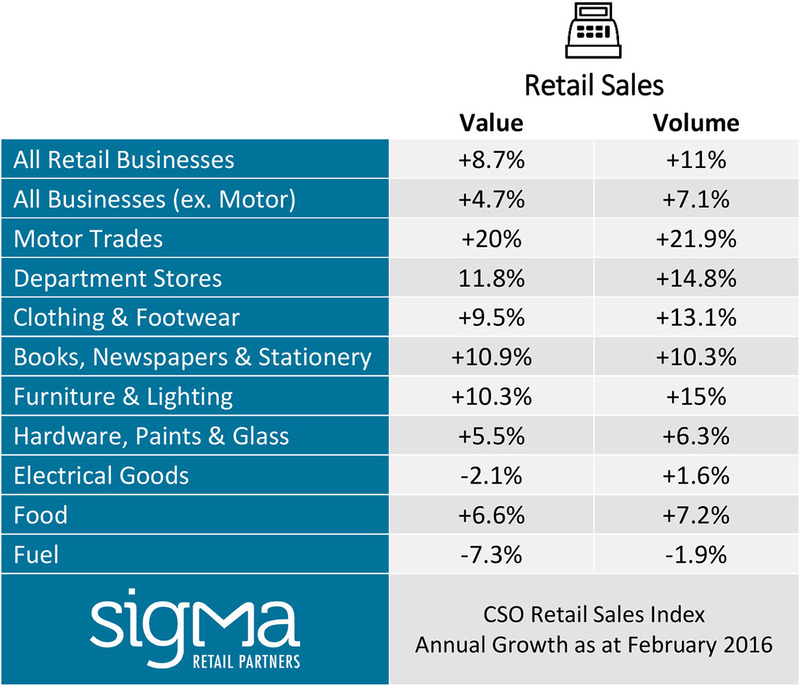 The breadth of the remarkable recovery in the retail sector is evidenced in the fact that all retail categories, with the exception of fuel, saw annual increases in volume terms while 11 out of 13 retail categories saw increases in sales values. The strongest performing categories were cars (+21.9%), furniture and lighting (+15%) and department stores (+14.8%). Annual growth rates in both the value and volume of sales for key retail sectors are outlined above.